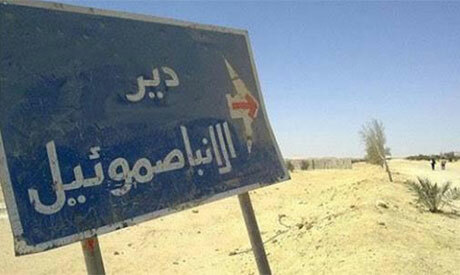 Egypt’s prosecutor-general Nabil Sadek has dispatched a team of prosecutors to the site of the terrorist attack on a bus which killed at least seven Copts and injured 12 near the Monastery of Saint Samuel the Confessor in Upper Egypt's Minya on Friday. In an official statement, Sadek ordered members of northern Minya prosecution and members of Supreme State Security prosecution to the site to investigate the attack. He also instructed the team to head to hospitals where the injured are receiving treatment to listen to their testimonies on the circumstances of the attack. Security forces are currently searching for the unknown gunmen who carried out the terror attack on the bus, the sources said. 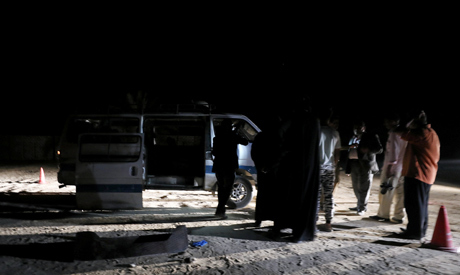 The sources added that the bus was using a back road to reach the monastery, adding that the main road to the monastery had been closed per security instructions due to the danger present in the western part of the governorate, where the monastery is located, and the lack of communication networks in the vicinity. Egypt’s President Abdel-Fattah El-Sisi called Pope Tawadros II, the head of the Coptic Orthodox Church, to express his sincere condolences for the victims of the terrorist attack, according to a statement released by the church. "I mourn with deep sorrow the martyrs who were killed today by treacherous hands which aim to undermine the firm fabric of the nation, and I wish speedy recovery for the injured," El-Sisi said. "I confirm our determination to continue our efforts to combat dark terrorism and apprehend the culprits," the president added. "This attack will not weaken the will of our nation in continuing its battle to prevail and build," El-Sisi said. 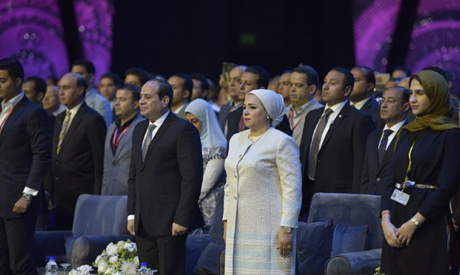 In the evening, El-Sisi and attendees at the World Youth Forum observed a moment of silence in Sharm El-Sheikh for the victims of the terrorist attack. Egypt's Azhar, the country's highest Islamic Sunni authority, condemned the terrorist attack, extending its condolences to all Egyptians and to the families of the innocent victims. In an official statement released on Friday evening, Al-Azhar said "the culprits of the cowardly terrorist attack are criminals who were stripped of basic human values and are as far as could be from the teachings of religions, which call for coexistence and peace, the renouncing of violence and hatred, and criminalization of the killing of the innocent." Egypt's Minister of Endowments Mohamed Mokhtar Gomaa also condemned the "terrorist, sinful and vile attack," saying "an attack on any person on Egypt's soil is an attack on all Egyptians." Gomaa said that it was a "religious, patriotic, and human duty to report any terrorist." Parliament speaker Ali Abdel-Aal also condemned the attack, saying "it aims to undermine the security and stability of the country." The country's State Information Service (SIS) issued a statement "expressing its deepest condolences to the families of the victims, stressing that the terrible crime will not damage the unity of the Egyptian people." "Such sordid attempts by desperate forces of terrorism will not affect the people of Egypt’s determination to move forward in their path to achieve security, stability and development throughout the country, and to eradicate terrorism," the statement said. The SIS said the "desperate attempt by terrorist groups is evidence of their weakness", pointing at "Egypt's extensive Comprehensive Sinai 2018 operation in securing Egyptian borders in all four directions and eradicating terrorism in Northern and Central Sinai." "Such despicable crimes will only reinforce the strength and unity of the Egyptian people and their dedication to rooting out terrorism," the SIS said, affirming "the need to respond to Egypt's successive calls for international solidarity in pursuing terrorism and its sponsors and supporters who provide it with funds, offer shelter to its leaders, and dedicate propaganda outlets to justify its crimes under misleading pretexts." The UK, Germany, and Arab States condemned the terrorist attack on Copts today. In a tweet, British Foreign Office Minister for the Middle East Alistair Burt said he was "appalled at news of the attack", adding that "his thoughts were with the families of the victims." "The UK will continue to support #Egypt and all its people in the fight against terrorism," Burt said. UK's ambassador to Egypt Sir Geoffrey Adams also tweeted to offer his condolences to Egyptians for the attack. "I offer my deepest condolences to all Egyptians as we mourn together the loss of innocent lives today. Britain stands with Egypt against terrorism," the ambassador said. The German Ambassador to Egypt Julius Georg Luy also denounced the attack. 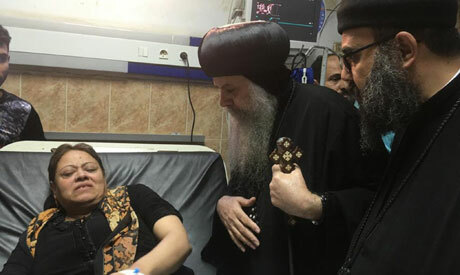 "I deeply suffered of this resurgent and vile attack on peaceful Egyptians in Minya," Luy said, adding that "there was no justification to carry out such violent terror attacks." The German envoy affirmed his country's support to Egyptian people. The US Embassy in Cairo said "it condemns in the strongest terms the terrorist attack on Egyptian pilgrims tofay in Minya and we offer our sincere condolences. We stand with the Egyptian government and people against terrorism." A statement by the European Union's Spokesperson for Foreign Affairs and Security Policy/European Neighbourhood Policy and Enlargement Negotiations also denounced the attack. "Today’s attack on a bus of Coptic Christian pilgrims in Minya, Egypt has again exacted a toll of civilian deaths and injured," the spokesperson said, adding that "the attack was a stark reminder of the security challenges that Egypt is facing." The EU spokesperson expressed "its condolences to the bereaved, and stands side by side with Egypt in its efforts to defeat terrorism in the country." Saudi Arabia also condemned the deadly attack, according to Saudi Press Agency. "The Kingdom of Saudi Arabia strongly condemned the shooting incident that targeted a passenger bus in Minya governorate in the Arab Republic of Egypt and resulted in the death and injury of a number of innocent people," SPA reported quoting an official source at the Saudi Ministry of Foreign Affairs. "The source reiterated the Kingdom of Saudi Arabia's stand with Egypt against these terrorist acts, extending condolences to the families of the victims and to the government and people of Egypt, wishing the wounded a speedy recovery," the SPA said. The UAE also condemned the attack, calling it 'heinous'. ''The UAE stands in solidarity with the government and people of Egypt in confronting extremism and terrorism, which seek to undermine Egypt's stability and its national unity,'' Sheikh Abdullah bin Zayed Al Nahyan, the Minister of Foreign Affairs and International Cooperation, said in a statement. King Abdullah II of Jordan extended his condolences to Egyptian President Abdel-Fattah-El-Sisi for the victims of the attack, condemning "the coward attack and stressed his country's support to Egypt in its efforts to fight terrorism, and preserving its security and stability." Kuwait's Emir Sheikh Sabah Al-Ahmad Al-Jaber Al-Sabah also expressed his condolences to Egypt's El-Sisi, according to the official Kuwaiti News Agency (KUNA). Al-Sabah expressed his country's "robust denunciation of this horrific terrorist act that targeted the innocent and aimed at jeopardizing Egypt's security and stability". Coptic Christians make up 10-15 percent of Egypt's 104 million population. In the last several years, Coptic churches have been the target of several deadly terrorist attacks, which left tens dead and injured. In May 2017, a terrorist attack by gunmen on a bus carrying Coptic pilgrims heading to the same monastery left 30 killed and two dozen injured. In August 2017, the interior ministry announced that a man suspected of involvement in the deadly armed attack on the pilgrims was killed during a shootout with police in Qena governorate in Upper Egypt. On 9 April of the same year, as Egyptian Copts celebrated Palm Sunday, a terror bomb attack inside Mar Girgis Church in the Delta city of Tanta killed 29 and injured tens others. On the same day, a few hours later in the city of Alexandria, a suicide bomber killed 17 people, including three policemen, as he blew himself up outside St. Mark's Coptic Orthodox Cathedral. as the head of the church, Pope Tawadros II, lead the service inside. In April 2018, an Alexandria military court issued preliminary death sentences against 36 people convicted of involvement in the deadly attacks in Alexandria and Tanta.